Meteorological equipment specialist Biral has just launched its new RWS-30 Road Tunnel Weather Sensor. The sensor is easily integrated with systems in road and tunnel applications and monitors obstruction to vision caused by fog, smoke and exhaust fumes. The RWS-30 is designed for use in road and tunnel applications where accurate and reliable visibility measurements are required. The forward scatter measurement principle provides a compact design with measurements that are both accurate and reliable in all weather conditions. 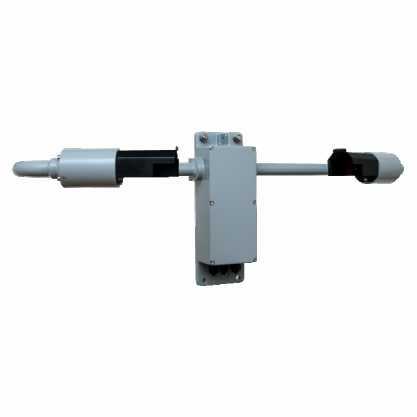 The RWS-30 outputs have been chosen to match those recommended for use in tunnel systems. As road networks become more congested, the management of traffic flow and road user safety is frequently using Road Weather Information Systems (RWIS) to collect the meteorological data needed to keep the traffic moving. Road tunnels pose a particular set of problems to highways engineers and management personnel as they are affected by the weather at either end and can have their own internal microclimates. Add this to the risk of pollution from stationary vehicles or fire after a crash and the need for a sensitive and accurate sensor to measure visibility becomes very apparent. The RWS-30 has been developed to meet the specific needs created by the tunnel environment and complies with current international guidelines as defined by the PIARC Technical Committee. The sensor is quick and easy to install and reduces lane closure requirements, and design features such as window contamination monitoring with automatic measurement adjustment allows maintenance to only be undertaken when needed. The safe operation of road tunnels is challenging as whilst fog and rain are unlikely the air quality can quickly deteriorate if the air flow through the tunnel reduces due to the weather. Visibility sensors, especially those with an extended visibility range, can act as sensitive pollution monitors allowing the ventilation systems to be activated before pollution increases to dangerous levels. The RWS-30 has a measurement range of 200m to 99.99km (with a resolution of 1m), making it very sensitive for both air quality and fire detection. To ease integration, the sensor has the ability to report EXCO or MOR as a 4-20mA current output as favoured in tunnel systems. Alternatively, either the serial data output or optional relays can be used. The measurement of visibility by forward scatter as used by the RWS-30 is now widely accepted and is seen as having significant advantages over more traditional techniques such as the use of backscatter sensors or transmissometers. Backscatter sensors share the RWS-30’s advantage of being compact; however, the backscatter signal is strongly dependent on the type of obstruction to vision. This results in poor accuracy and limited upper range. More importantly, due to the problem of reflections, backscatter sensors require a large open area in front of the sensor to operate correctly. All Biral visibility and present weather sensors have the capability to temporarily output specific data via a test mode. In this mode the user can define visibility, window contamination and fault conditions for a pre-determined time period. This functionality is useful during Factory or Site Acceptance Testing (FAT or SAT), or system integration to test downstream processing of the output data. For further editorial information contact Nathan Neal of Biral on +44 1275 847787, email:enquiries@biral.com or Julia Fitzgerald of Vantage PR on +44 1600 715251 or email pr@vantage.uk.com. For editorial charge requests please email Brenda Christopher at brenda@vantage.uk.com.